What a lovely day. 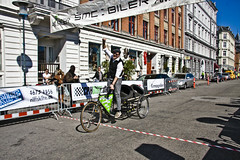 The first 'svajer' race in almost 50 years took place last Saturday - April 18th - in Copenhagen. 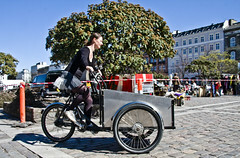 'Svajere' - as we blogged about previously - were the bike messengers that ruled the streets of Copenhagen for decades in the first half of the 20th century, riding their huge box bikes and livening up the streets with singing, whistling and banter. 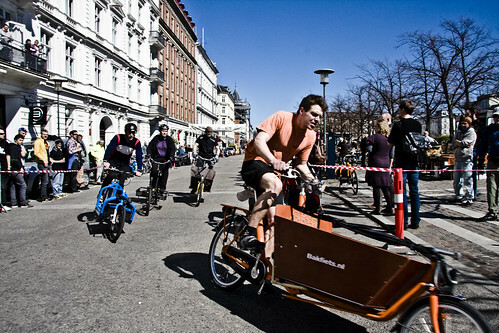 This year, the Svajer race was revived - aka The Danish Cargo Bike Championships. It was a fantastic day out on Israels plads. In the video above, my son [aged 7] shot the shaky video and I supplied the stills. The first song is a 1930's tribute to these 'svajere' - asphalt cowboys, they were called - and the second song is from the 1970's where Povl Kjeller sings about how happy he is about his bike. 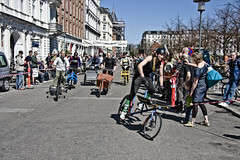 Anyway, the Danish Cargo Bike Championships was a festive affair in bright spring sunshine. I don't think I've ever seen so many cargo bikes gathered in one place. The course was set up around the square with a fine mix of smooth straights and cobblestoned corners. 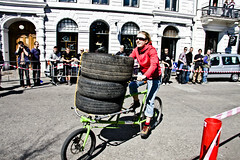 The relay race was a treat, with teams of four sharing a bike first without and then with a tyre on board. Here it wasn't just speed demons taking part. Girls in skirts, friends, collegues, you name it. All enjoying the race. It was Team Bullitt from Larry vs. Harry that took gold, however. The newly formed Copenhagen Bicycle Police Unit were supposed to show up and race against bike messengers on fixies but they backed out at the last minute. Chicken shits. I'm figuring that they were afraid of losing so soon after their debut on the streets. And they would have lost as the fixie boys were bloody fast. They beat an All-Star team on Bullitts in the final race. The course was quite cool. The faster bikes easily hit 40 km/h on the stretches without cargo and the tight cobblestone corners would do Paris-Roubaix proud. 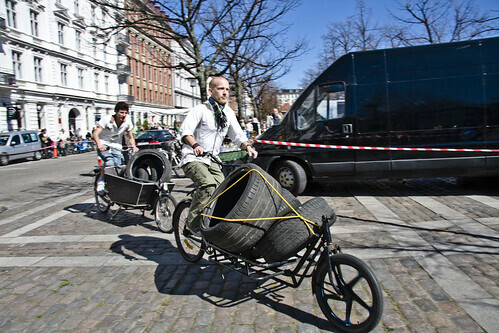 In the breaks between races Copenhageners on cargo bikes tried out the course with their kids. 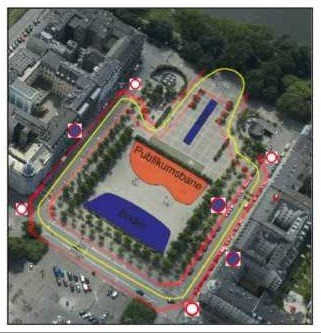 Not only did the Police let the race down, but the Danish Cyclists Federation [DCF] didn't fancy participating either. Unbelievable. The finish line was almost right outside their offices and shop but they didn't want to be involved with the race and I heard that they declined even writing about the race in their membership magazine. "We did a piece on recumbents a while back, so no thanks." Recumbents are not cargo bikes, as far as I'm aware. And these 'svajer' races are a historical event. The people who arranged the race were quite shocked that the DCF didn't want to know. But then again, who needs a dusty old cyclist federation living in the past and married to the car-centric Road Safety Council when you have.... Copenhageners. Regular citizens showing up to race or to watch and to see the revival of these historic races. Not to mention passionate people arranging the whole day, including Firmacyklen.dk, Larry vs. Harry and a cycling club Amagerringen who manned the barbeque and helped out big time and the City of Copenhagen's Bicycle Office. The date is set for 2010 - April 10th. Mark it in your calendar. It's going to be bigger and better. Addendum: Danes don't have a patent on these historical races. 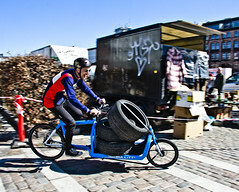 Here's a great website highlight the history in other countries of cargo bike races. Great reading. You can see all my photos from the day over in this set on Flickr.